- 5041 (Combination Entry; Auto-locking with pass-thru feature; Secure Combo Change). - Delivery: The Simplex 5041S-26D Pushbutton Lock is In Stock and Available to Ship. Passage Mode (5041) - allows access without using the lock entry mode. Feature activated from the inside with a thumbturn or key (included with all passage feature models). Key Override (Optional): Key Override models (5041) accept removable core cylinders. - 5041 - Combination Entry, Key Override, and Passage: Auto-locking with pass-thru feature. Combination Entrance Combination Chnage from secure (interior) side of door. Meets Department of Defense (DOD) Requirements. 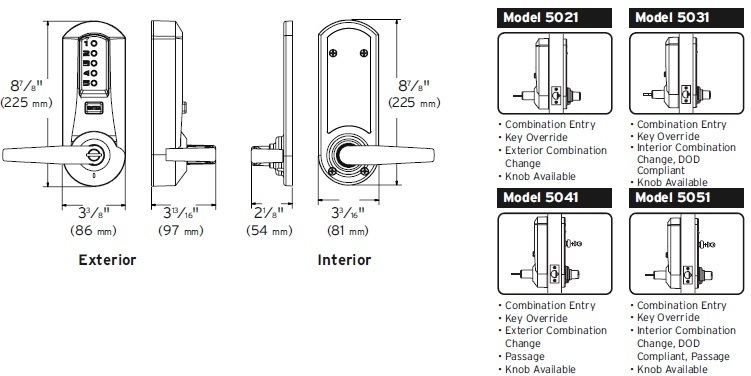 Keyway: Schlage (5041S).